3 miles to Bromley, 3 miles to Manchester outlets, 9 miles to Stratton Access Rd.,Very private on Bromley Brook, 1800 sq ft. Great fireplace, incredible mountain views, close to everything. Washer/dryer, dishwasher, gas grill, stereo/mp3 hookup, full linens, dishes, silverware, etc.. Walk to Long Trail. A perfect family setting! This is a home that we use and also rent out so it is well kept and cared for. We encourage families, this house accommodates 2 families very nicely. There is a lot of privacy and lots of places to explore with the Bromley Brook viewable from the house as well as Spruce Peak. The Long Trail is walkable from our house and the snowmobile paths are close enough to access from the house (less than one mile). The convenience of our location is hard to beat if you want to ski or golf but also want to have easy access to the town of Manchester and the shopping and outlets that are available there. Some of the best foliage views out the back deck since the trees are mostly hardwoods. 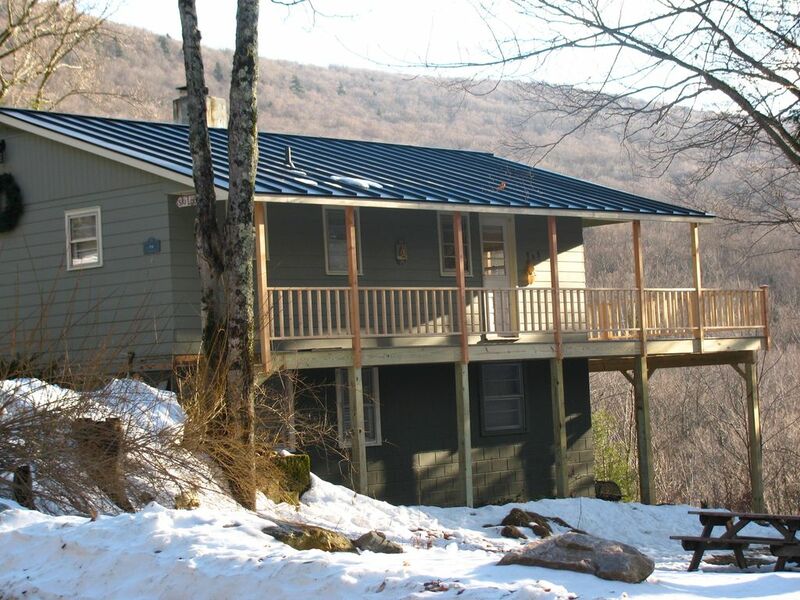 We love the privacy yet convenience to Manchester Center and skiing. It is a great house for unwinding and retreating from the hustle and bustle of every day stress. A great view of Spruce Peak which is also a hiking trail on the Appalachian Trail. Ping pong table in garage for warm seasons. Great family place. Cozy with a lovely view. We really enjoyed our stay over Christmas vacation. The house was comfortable and in a good location. We loved the area and it was great being so close to Manchester. The owners were really nice and a pleasure to work with. We will definitely stay in this house again! We enjoyed are stay so very much. Missed the colors by a week or two but we loved the view and just hanging around the fireplace. There is plenty of room and the home is very well appointed. Loved this house and location. Hope to visit again ! So glad you liked the house Katie. We look forward to having you back next year. Very comfortable home in a perfect location close to Bromley, Stratton, and downtown Manchester VT. Plenty of beds for our group of 6 and linens were included. Large fireplace was a perfect place to relax after a day on the slopes. Updated wifi and electronics worked well. Dave & Susie are super easy to work with and they provide very clear info on opening/closing and nearby restaurant recommendations. We'll be back! Thanks so much and we're so glad you enjoyed your stay! We hope to have you back again. We really enjoyed our time at this house. It was a perfect location and really nice house. The owners were more than helpful throughout the whole process and we highly recommend staying here! We are convenient to 5 major ski areas, and less than a mile to the Long Trail access road for snowmobiling. 3 minutes to downtown Manchester, the outlet capital of Vermont. There are several swimming lakes within 10 minutes and the Dorset quarry is also very close. There are 5 or 6 championship golf courses within 20 miles from our house including Equinox, Stratton, Haystack, Mount Snow, and Okemo. Killington is also less than an hour away.